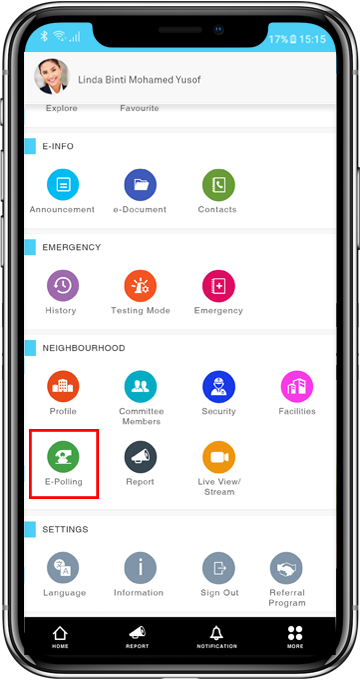 The E-Polling feature in i-Neighbour is one that allows Admins to easily conduct simple surveys and collect votes from administrators, committee members and residents without having to call up for an actual meeting. 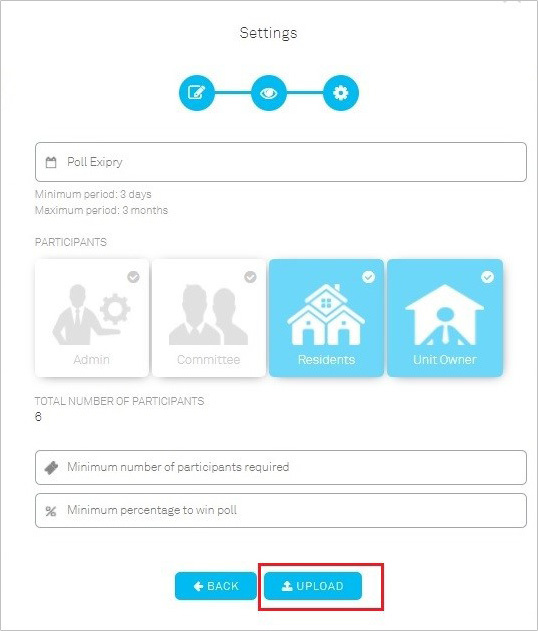 For maximum convenience, this feature is also fully available on both i-Neighbour Web and Mobile App thus Admins and Residents can choose their preferred platform when creating, monitoring and responding to the polls. 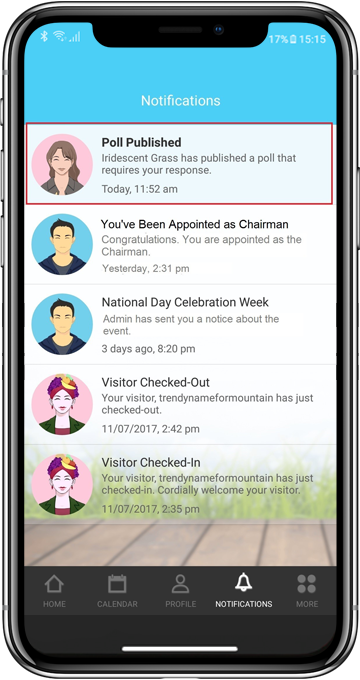 a) Admins create Poll, configure the required settings such as poll questions, participants, expiry date, acceptance rate and etc. before publishing the poll. 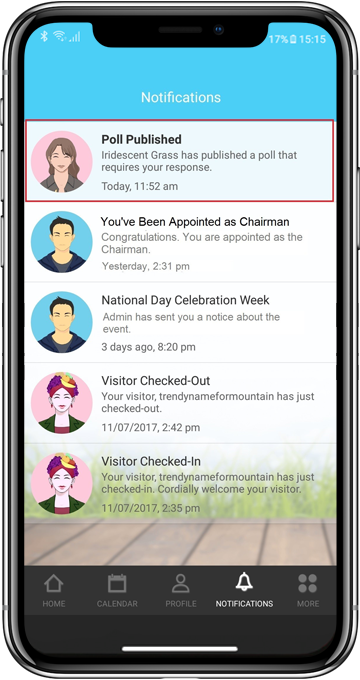 b) Subsequently, the selected residents will each receive Web and Mobile notifications inviting them to cast their votes anonymously. c) Once the polling period ends, the result will be displayed to the Admin that created the poll and all the selected participants/residents. 1. Login to your Admin account. 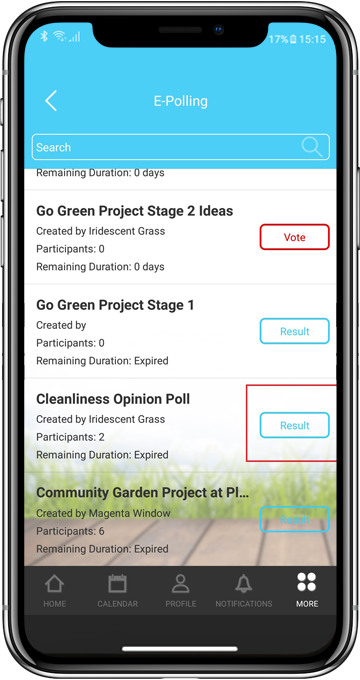 Go to Neighbourhood > E-Polling > Click the “Create Poll” button. 2. 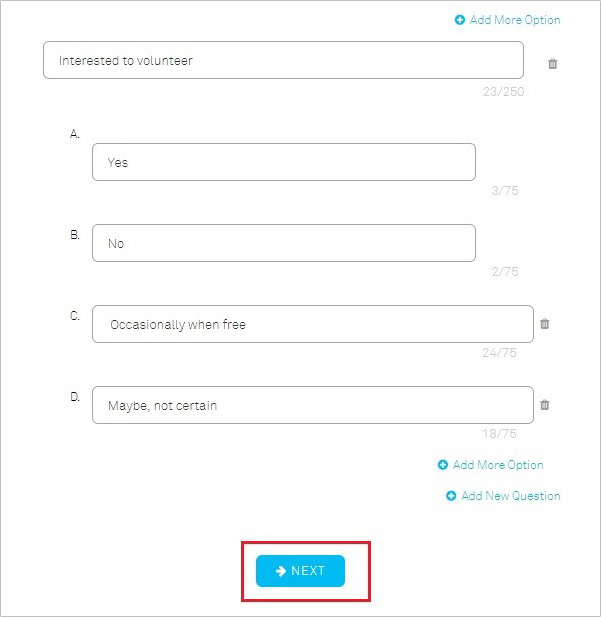 Fill in the required fields of the form. Please note that each field has a pre-set character limit. Click on the “ + “ buttons to “Add more Questions” or “Add more Options”. 3. Once you have configured all your questions, select Next. 4. A preview of the poll will be displayed > choose Next. 5. Configure the remaining settings: Expiry date, Participants, Minimum No. of Participants required and Minimum % to win > Click Upload. 6. 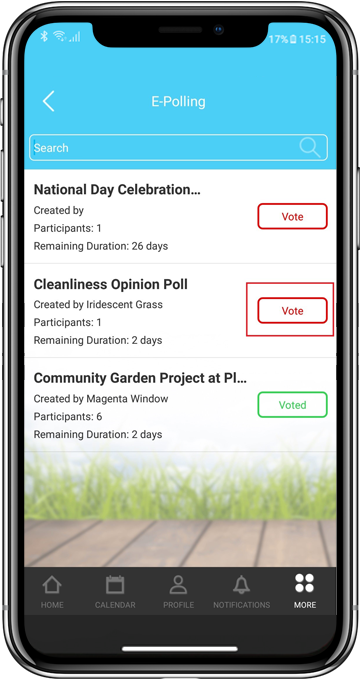 Once you have published the poll, the selected participants (Admins/Committees/Unit Owners/Residents) will be notified via Web & Mobile as well as be invited to vote. 7. The results will only be displayed once the poll ends. In the meantime, you can view the response rate (No. of Participants) to date. Click “View” under status column to access more details and other options. 8. You can choose to edit the Expiry date or Cancel Poll. 9. 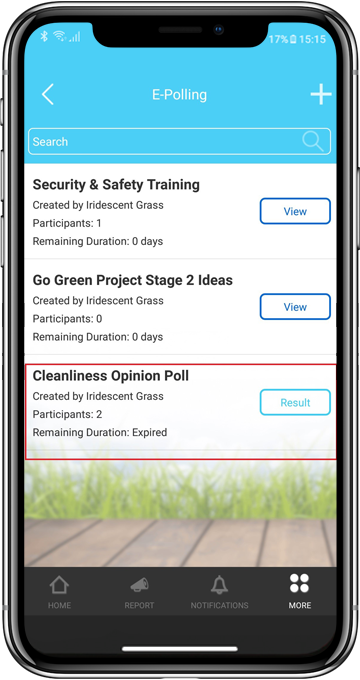 Once the poll closes, click to view “Results”. You will also be notified via Web & Mobile. 10. This poll has been marked “Valid” after receiving a full response, given a pre-set minimum respondent of 1. However, none of the questions fulfilled the minimum 51% vote to provide a majority. 1. Log in to your Admin account. Go to Neighbourhood > E-Polling > Select “+” or “Add Now” to create a new poll. 2. Fill in the required fields of the form. Please note that each field has a pre-set character limit. 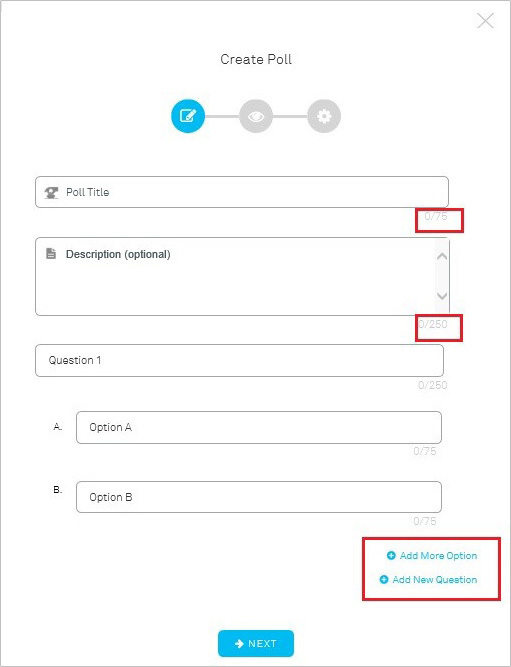 You can also choose to “Add more Questions” or “Add more Options”. 3. Once you have configured all of your questions, select Next. A preview of the poll will be displayed > choose Next again. 4. Configure the remaining settings: Expiry date, Participants, Minimum No. of Participants required and Minimum % to win > Click Upload. 5. 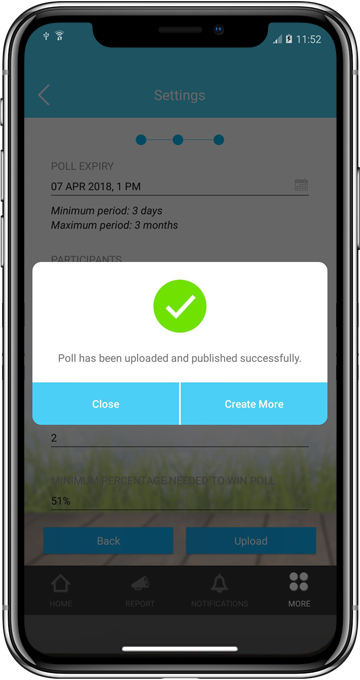 Once you have published the poll, the selected participants (Admins/Committees/Unit Owners/Residents) will be notified via Web & Mobile as well as be invited to vote. 6. The results will only be displayed once the poll has ended. In the meantime, you can view the response rate (No. of Participants) to date. Click “View” to access more details and other options. 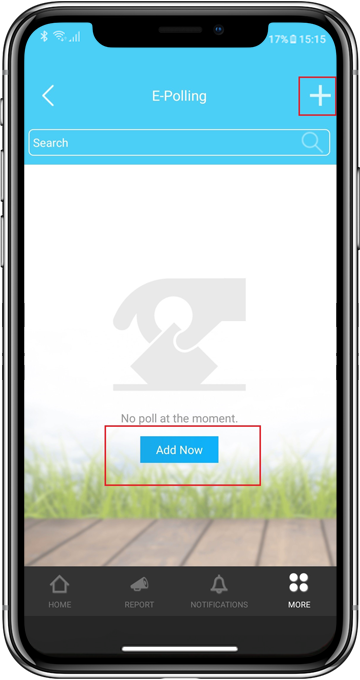 You can choose to edit the Expiry Date or Cancel Poll by selecting the 2 icons at the upper-right corner. 7. Once the poll closes, click to view “Result”. You will also be notified via Web & Mobile. 8. In this instance, the overall result is considered “Valid” as the No. of respondents fulfil the pre-set minimum of 2. However, only 1 of 3 questions has obtained a “Pass”, a majority answer based on a minimum of 51% vote. 1. Firstly, if any Admin publishes a poll that requires your vote, you will be notified via Web & Mobile as well as be invited to respond. 2. Go to Neighbourhood > E-Polling and click “Vote”. 3. 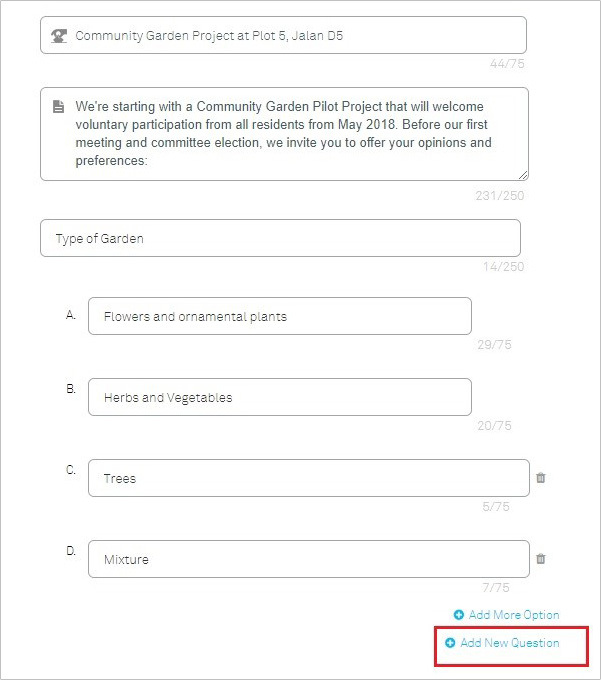 You can only select one option for each question and have to answer all questions before you can press “Vote”. 4. Please note that you can’t change your answers once you have submitted the response form. 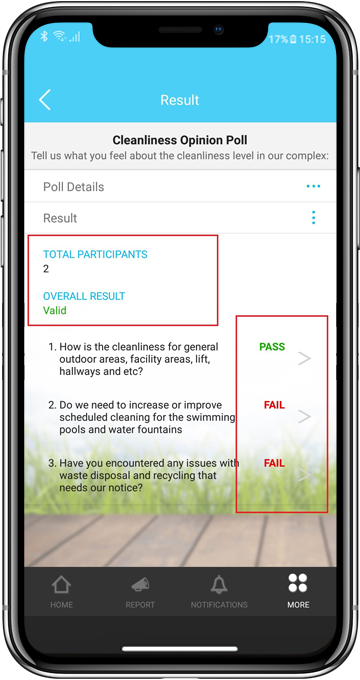 The results will only be displayed once the poll has ended; click to view “Result”. 5. In this example, the overall result is considered “Valid” as the No. of respondents fulfil the pre-set minimum of 2. However, only 1 of 3 questions has obtained a “Pass”, a majority answer based on a minimum of 51% vote. 1. 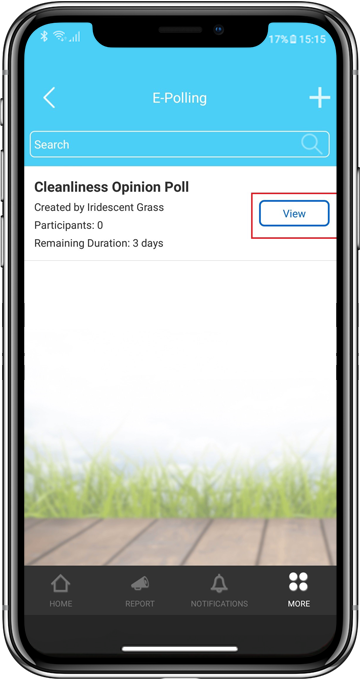 When any Admin publishes a poll that requires your vote, you will be notified via Web & Mobile as well as be invited to respond. 2. 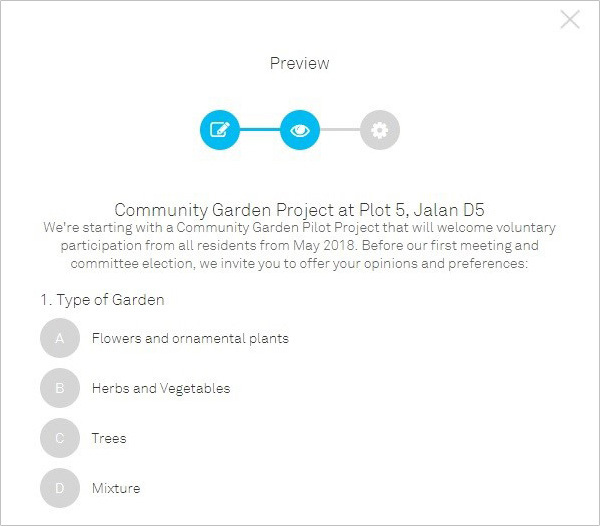 Go to Neighbourhood > E-Polling and select “Vote”. 1.Can this E-Polling replace AGM? No, E-Polling is not meant to be a method for replacing voting in an AGM. In Malaysia, AGM is a legal requirement for management corporations and resident associations, so you must still hold AGMs in accordance with the prescribed rules to make important decisions. 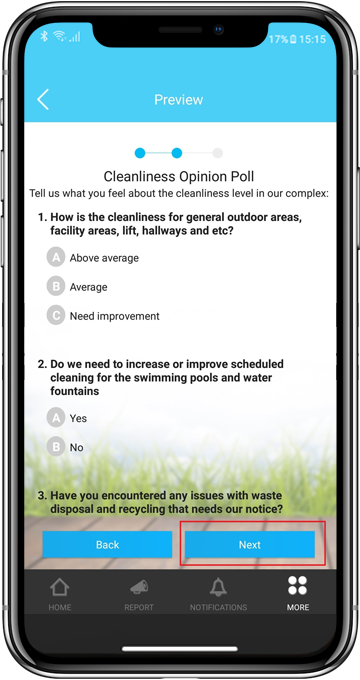 E-Polling is just a place for the management to gather information/ feedback from the neighbourhood. 2. How do I see the final result? 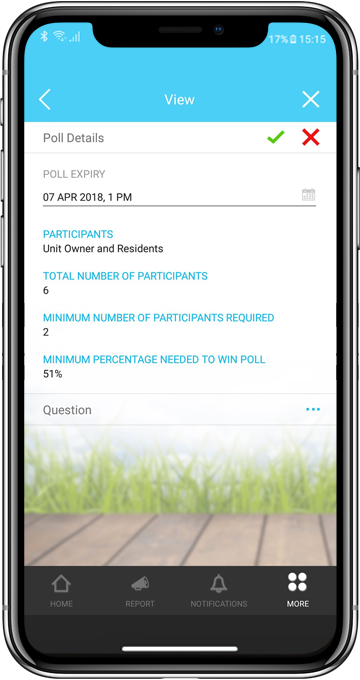 At the end of the polling date, the result will be displayed to the Admin that created the poll and all the selected participants/residents. 3. Why is the poll not successful even though one of the options clearly got the majority votes? This is because the poll did not reach the expected number of votes to ensure its validity. 4. Is there a master list of all the polls published for the neighbourhood? For instance, can the System Admin account see a full history of all polls ever created, including those added by other Admins? Yes, all Admins (including the System Admin) can view and print a full list of all the polls published for the neighbourhood. However, they are only able to view polls created by another Admin but will not be allowed to edit or cancel those polls. 5.Is it possible to allow another Admin (besides Poll Creator) to have full access rights to the Poll functions (view, edit, cancel)? 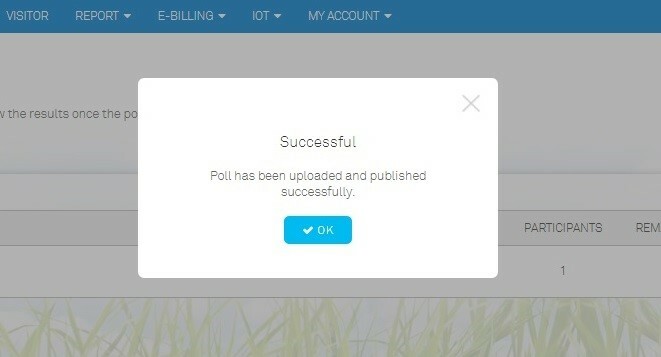 No, only the Poll Creator has full access rights to the Poll functions. This is to prevent any unauthorised changes to the poll. 6. I noticed the setting for Participants only allows the selection of whole category (ies). Is there a way to customise my participants list with individual names/units or remove certain individuals? 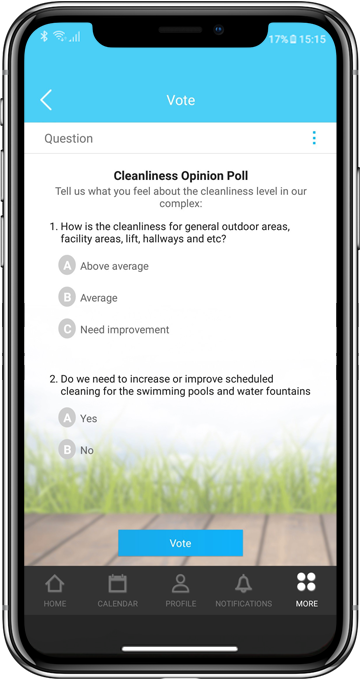 Unfortunately, you may only choose a broad category since this is provided as a general way to gather feedback on the neighbourhood’s issues. It is also designed to be inclusive, thus you are not able to specifically restrict certain individuals from participating in the poll. 7. I know I can use the ‘Print’ function to print the Poll Listing (general details). 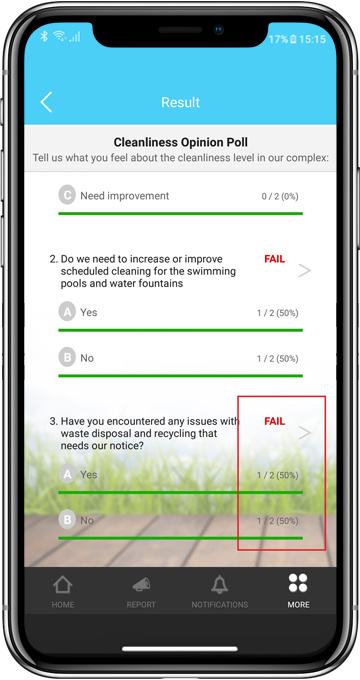 How about printing the full Results (including questions, answers and vote count)? At the moment, the results can’t be printed out or exported but you’ll always have access to these records in the account. 8. I’ve already uploaded the poll and I’ve missed something. Can I still edit the questions or other settings? 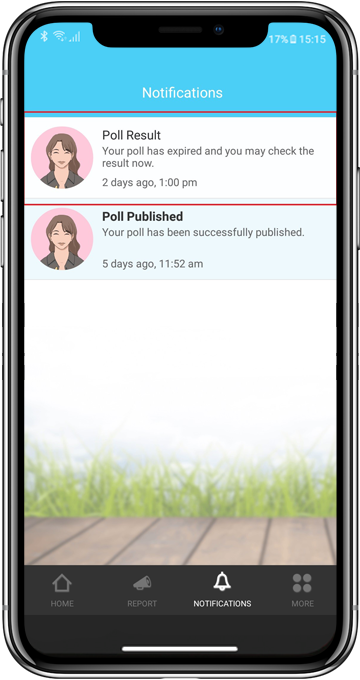 System notifications will go out immediately to participants once you’ve published the poll and they can also start voting. Therefore, to be fair and transparent, most of the details and rules can’t be edited. You can only change the expiry date or cancel the poll. As such, you’ll probably have to cancel the poll and create another one. 9. If I have cancelled the poll, will I be able to re-activate it? No, you’ll not be able to re-activate the poll once it is cancelled. 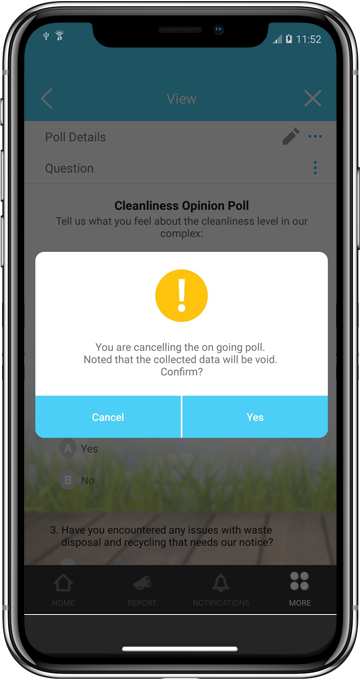 Notifications of cancellation would have been sent immediately to all participants once you’ve cancelled the poll. 10. Is there a delete function available? No, in order to maintain records/trails, you can’t delete the record of the poll itself, even if you’ve cancelled it. 11. If there are new residents that join our neighbourhood after my poll is published (selected Resident category as participants) will they be invited to vote too? Yes. 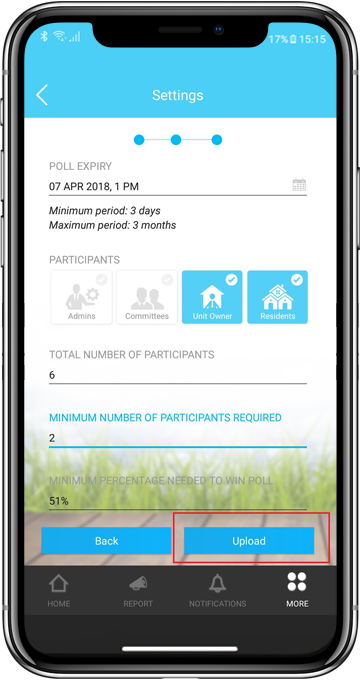 Although they will not receive a notification about the poll but they can still participate by going to Neighbourhood > E-Polling and choose “Vote” for the on-going poll. 12. Is there any difference between using Web or Mobile for this E-Polling feature? 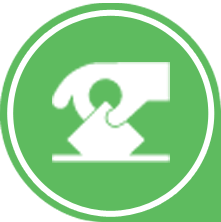 No, all functions are fully available on both Web and Mobile, except the ‘Print’ function for Admins, which you can only find on the Web Portal. 1. Can I change my vote? 2. Am I casting my vote anonymously? Yes all votes are casted anonymously. 4. Why can I view the vote but my family members can’t? Because the Management has set that the poll could only be seen by the house owners only. 5. I’ve voted on a poll some time ago but I can’t remember my answers. Will I be able to view a record of my votes? If the poll has not ended, you will still be able to view the options that you’ve picked. Once the poll has ended and the votes are tallied, you’ll only be able to view the collective count and Results.